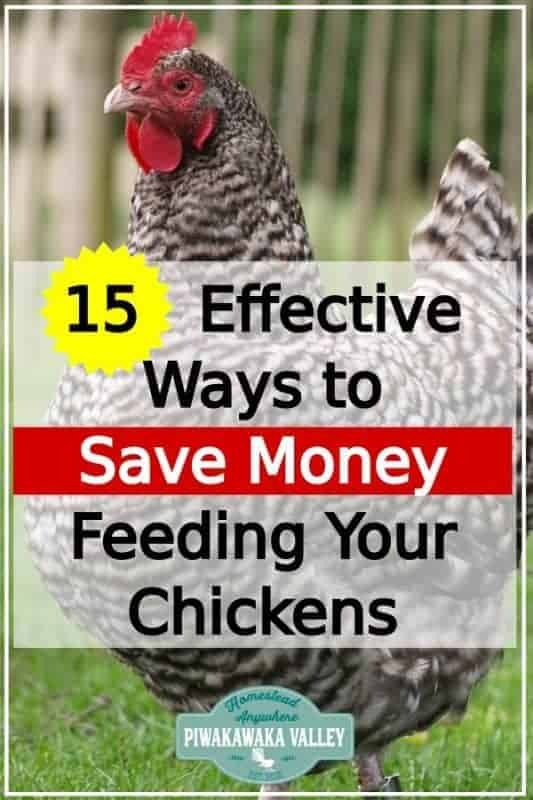 15 Effective Ways to Save Money Feeding Your Chickens: Cut your chicken feed bill in half! 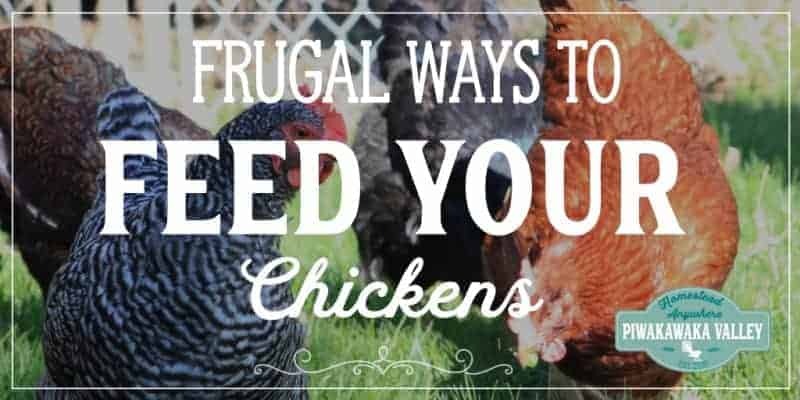 If you are a frugal fanatic like I am, you will be looking for cheap ways to feed chickens. Not cheap chicken feed like really not good for them. No, here we are looking for healthy, nutritious ways to reduce your chicken feed costs. Fermented chicken feed is more nutritious than standard feed, and the birds actually need less of it. Fermenting your chicken feed will not only save you a ton of money, but your birds will be better off eating it too. Find out how I ferment our chicken food here. By fermenting our chicken feed we have reduced our chicken mash bill by 30-50%. We have found that of the 2 most common local farm stores, one is $3 a sack cheaper than the other. Then we found a local farmer that sells if for $3 cheaper again! Safe to say we deal with the inconvenience of having to meet the farmer at his drop off points on a Monday morning to save our $6! The more you buy of most things, the bigger discount you can negotiate. Buying grain for your 3 birds from the supermarket might be convenient, but I worked out that I would be paying 3 times as much per kilo if I did that. If we had the space we would get a grain silo. Then you can buy by the ton and save a truckload of cash! Part of what you are paying for with a premixed feed is the labor involved in actually combining it. Find a feed recipe that works for what grains you have available to you. Shop around for each grain and supplement and see where you can get the best deals. Also, don’t forget to check with the local farmers in your area. Sometimes they’ll have older grains sitting around that aren’t fit for human use, but would be fabulous for your flock. Garden Betty has a free feed calculator that you can use here. Chickens are notoriously wasteful. You watch them eat, they scratch a lot of that food out on to the ground! And once they have finished along come the birds, mice and rats to have their fair share as well! Chickens only need 1/2-1 cup of feed each per day. 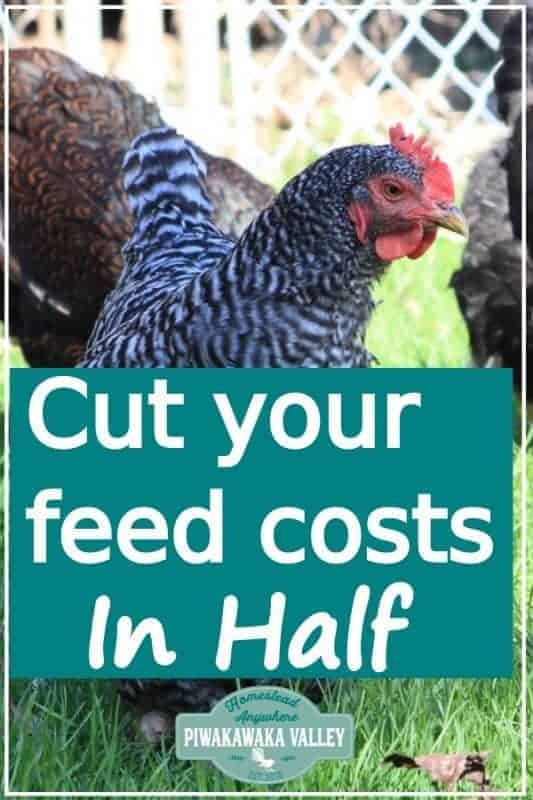 Limit the amount of feed you give them, and watch your food bill drop. Obviously don’t drop it so low the chickens are starving and your egg production drops, but there is a fine line in there that you need to find with your flock. We got so sick of the sparrows eating half our feed that we bought one of these, and our feed bill dropped by 20% over night! It paid for itself very quickly! Obviously, if your chickens are getting some of their food themselves, you don’t have to provide or pay for it! Some breeds of chickens are better forragers than others, but all laying breeds can get about 25% of their feed requirements by foraging easily. Some people choose not to feed grain at all and solely let the chickens free range. The benefit is that you know all your eggs are pasture fed and organic. The down side is if the chickens cannot find enough protein out and about, that the egg production will suffer. This is a fancy term for feeding chickens poop. WAIT, it isn’t as bad as it sounds! If you own a grass eating animal, especially a big one like a cow or a horse, their manure is a hive of bug activity very quickly. Chickens love nothing more than scratching through a big ol’ pile-o-poop to hunt for bugs! There are some large operations now feeding chickens nothing but compost, and the chickens and the compost are both thriving! Chickens love household scraps! Veggies, left overs, fruit you name it, they will probably eat it. 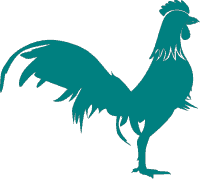 Check here for a list of what to and what not to feed the chickens. There are many easy to grow leafy greens that chickens just love to eat! Grow a garden of whatever grows best in your area – spinach, kale, cabbage, endive, lettuce, and swisschard are all good option. 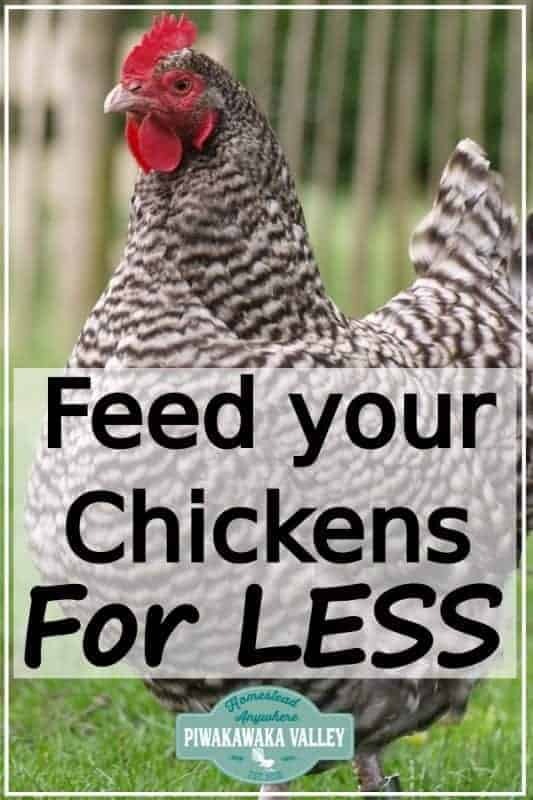 Any little bit of extra free food for your chickens adds up to lots of savings. When you are in the vegetable garden, throw all your spent vegetables, weeds and bugs and slugs in to a bucket, then take them down to the coop and let the hens go for it! We get veggie scraps from a local turkish restaurant for our hens. We get two big bins a week! The hens love to scratch through their pile of free chicken food, and on the days they get a bin full, we don’t have to feed them any grain! 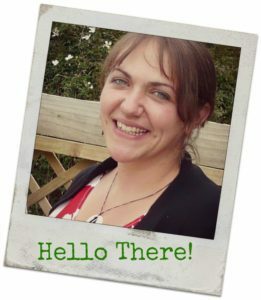 Fodder is a brilliant way of getting more out of your grain! 1 pound of grain can render 4-5 pounds of feed! 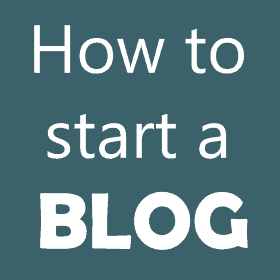 You will need to take some time to set up a fodder growing table, and it does take some time each day to water, harvest and sow the next batch. We found fodder a fantastic option for feeding to both our chickens and our meat rabbits. I know it sounds gross, but soldier fly larvae are quite a common thing for people to raise specifically for feeding to chickens. Another option is to take a large bucket with a lid and drill holes around the bottom and a bigger hole near the top. Hang this in the coop with some old meat in it. The flies will come in the top and lay eggs in there. The maggots will wriggle out the bottom and be eaten by very happy chickens! Do you have a milking goat or cow, or know someone that does? Often there is too much milk to keep up with! Whey from making cheese is a great, high protein chicken supplement, as is yogurt. If you follow all, or even just some of these steps, you will be able to significantly reduce your chicken feed bill! 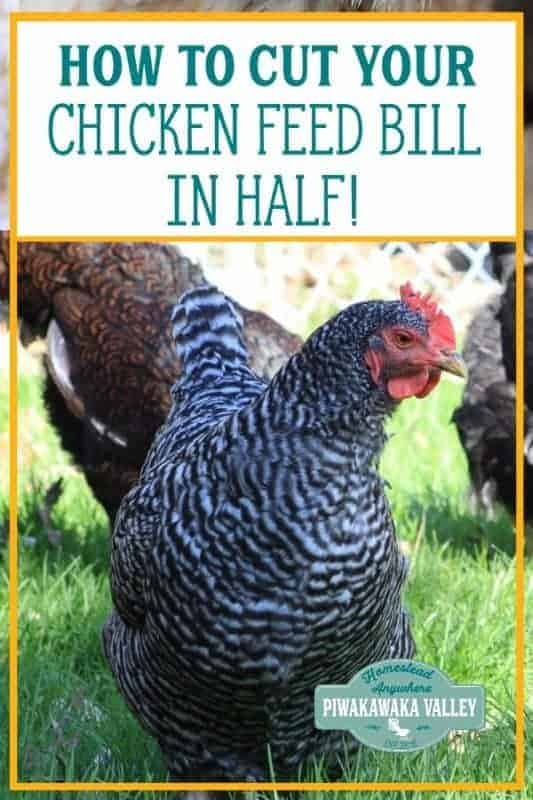 We managed to reduce what we were paying to feed our chickens by about 75%! The best thing is now our chickens eggs that we sell covers the cost of feeding all our other small animals and the goats grain ration as well.